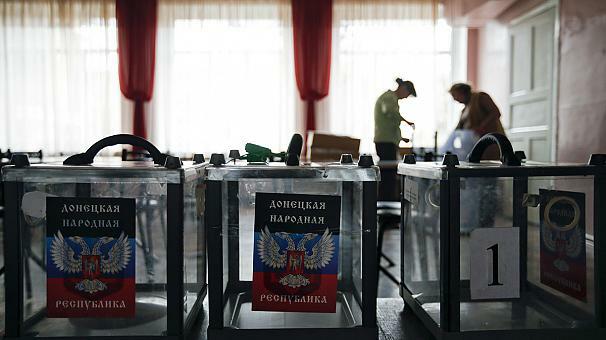 Rebels in eastern Ukraine are holding elections denounced by the West as “illegitimate”. Presidential and parliamentary polls are being held in the two self-proclaimed people’s republics in the Donetsk and Luhansk regions. Ukraine, the US and EU say they will not recognise the elections but Russia has given its support to the polls. At least seven Ukrainian soldiers have been killed since Friday amid intensified clashes in the region. The Donetsk and Luhansk regions fell to separatists after months of fighting in eastern Ukraine that ended with the Minsk ceasefire deal in September. Rebel leaders say that as independent states they are not required to observe Ukrainian law and therefore did not participate in Ukraine’s national elections last week. They say three million ballots have been printed for the polls, which will provide for directly elected presidents and parliaments. “These elections are important because they will give legitimacy to our power and give us more distance from Kiev,” Roman Lyagin, election commission chief of the Donetsk region, told the AFP news agency. Western leaders and ministers in the capital Kiev say the territories must abide by the truce, which was agreed with Russia, and hold local elections under Ukrainian law in December. “We deplore the intent of separatists in parts of eastern Ukraine to hold illegitimate so-called local <<elections>> on Sunday,” the White House said in a statement on October 31. However, Russian President Vladimir Putin has said the Minsk deal provided for elections “in co-ordination with, not in line with” Ukrainian plans. Alexander Zakharchenko, the acting head of government in Donetsk, is widely tipped to become the region’s president. Meanwhile, Igor Plotnitsky is being touted by Russian media as the favourite to win in Luhansk. The elections come amid continuing violence in eastern Ukraine. A spokesman for Ukraine’s army said on November 1 that seven soldiers had been killed and 10 wounded during 24 hours of fighting across the breakaway regions. At least 3,700 people have been killed in fighting since armed separatists took over government buildings in Donetsk and Luhansk in April.